Fratres by Arvo Pärt is one of my favourite pieces of music. The analytical meets the aesthetical as Pärt takes us on a meditative, harmonical journey, built up from a simple set of mathematical rules. Many people who listen to Fratres find it repetitive or even boring at first. After a while, though, they start to unconsciously recognize some of the patterns in the music. In a sense, they develop an intuitive feeling for what comes next in the sequence. Then, if they are the inquisitive, puzzle-solving type of person, they will try to understand the patterns rationally as well. This gradual awakening, whether intended by the composer or not, is perhaps what fascinates me most about Fratres. I have interpreted Fratres in the form of a dual SID tune. If you downloaded the SID file, note that there are two subtunes. The first subtune uses arpeggios to play the tune on a single SID chip, whereas the second one (recommended) addresses two SID chips (at $d400 and $d500). To play the dual SID version with sidplay2, include -fd -o2 on the command line. Warning! Spoilers ahead. If you enjoy solving puzzles, you may wish to search for these patterns yourself. In any case, I strongly recommend you to listen to the entire piece at least once before reading on. Have you listened to it now? Good. The overall structure of Fratres is simple: Vertically, the piece is divided into two drones (an A and an E that last throughout the piece), three moving voices (low, middle and high) and some percussion (claves and bass drum). Horizontally, ten refuges separate nine segments. Each segment contains a series of chords arranged in some kind of harmonic progression. Between each pair of segments, a recurring, harmonically empty percussion motif — the refuge — offers a moment of contemplation before the next chord sequence. The following picture illustrates the refuges and segments as a (terribly long) pedestrian crossing. 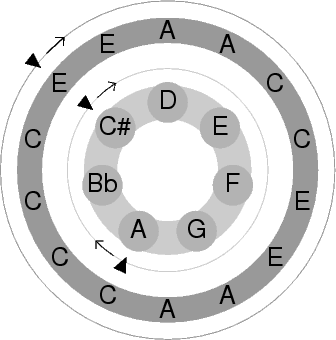 Each segment can be further divided into two halves: The first half consists of falling chords, and the second half consists of rising chords. Within each segment half, three voices combine to play a sequence of chords. Each sequence consists of eight different chords played in three different orders (let's call them bars). They are: 1, 2, 7, 8 — 1, 2, 3, 6, 7, 8 — 1, 2, 3, 4, 5, 6, 7, 8. For instance, in the first half of the first segment, the eight chords are: (C#, A, E), (Bb, E, D), (A, E, C#), (G, C, Bb), (F, C, A), (E, C, G), (D, C, F) and (C#, A, E). Thus, in the first bar we get: (C#, A, E), (Bb, E, D), (D, C, F), (C#, A, E). In order to understand the algorithm behind Fratres, we just need to figure out how to form the eight chords that build up each segment half. That is what the remainder of this article will focus on. Fratres is composed in the tintinnabuli style invented by Pärt. This basically means that some voices are restricted to playing notes from a particular triad (in Fratres this is the A minor triad), while other voices play melodies. The drones, A and E, are obviously only playing notes from the A minor triad. The middle voice in the chords is also restricted in this way, so it will only ever play A, C or E in some octave. The high and low voices, however, play notes from the harmonic D minor scale. Note how the C sharp in the D minor scale contrasts with the C natural in the triad. The low voice starts at C#. The high voice starts at E (and is transposed one octave further up). 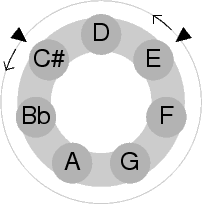 For the eight falling chords (the chords that build up the first half of the first segment), each voice simply moves around the circle, counter-clockwise, until it completes a full revolution at the eighth chord. For the rising chords, we do the same procedure clockwise. Much like the international date line in the pacific ocean, we add a seam, where the notes get transposed one octave. This will ensure that we end up where we started. To achieve symmetry, this is done when we've come exactly half the way around the circle, i.e. between chords 4 and 5. We want the middle voice to sync up to the low and high voices after one complete revolution. Alas, three doesn't divide seven, so we're forced to have some sort of assymmetry in this circle. Pärt has resorted to using four consecutive C:s, as can be seen in the lower left part of our circle. Why four consecutive C:s? We can only speculate, but my personal theory is this: The ethereal, timeless sound of this whole piece is partly due to the fact that it lingers somewhere in between A minor and A major. This delicate balance is maintained using the C natural from the triad and the C sharp from the melodic voices. By choosing to duplicate the C in the middle voice circle, one prevents the piece from tilting too far towards A major. All right, but why not double the other C group, the one in the upper right part of the circle? That's easy. If we did that, then the middle voice would end up playing C natural at the same time as another voice would be playing C sharp. That would be too dissonant. 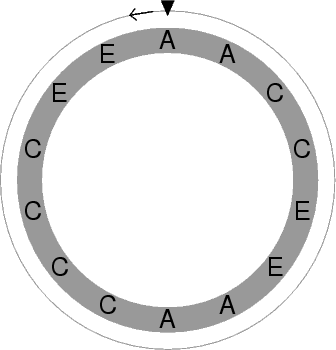 Just like the low and high voices, the middle voice traverses the circle counter-clockwise during the first half of a segment, and clockwise during the second half. Both these journeys begin at the indicated note, e.g. the top A for segment one. But this circle contains fourteen notes rather than seven, so the middle voice does not play its own retrograde in the second half like the low and high voices do. To get the low, middle and high voices for the following segments, we simply move each starting point two steps around the circle, in the counter-clockwise direction. The following diagrams show the starting points for the falling and rising halves of segment number two. This rotation, two steps at a time, continues for the entire set of nine segments. Thus, segments 1 and 8 will be identical, as will segments 2 and 9. And that is how you extract beautiful, complex harmonic content out of a simple formula. Beautiful SID. Outstanding work, beyond words. And the description/explanation of the pattern is pure genius. Thanks for your wonderful page. I am completely amazed by Fratres and am listening to all the versions on my online music service as the piece is new to me. I see it is also your favorite piece. But when I looked it up on Wiki the text citing your analysis seemed a little dismissive of the piece where it says: "The chord sequences themselves follow a clear pattern, and while the progressing chords explore a rich harmonic space, they nevertheless appear to have been generated by means of a simple mathematical formula." Were you saying that the piece is somehow simple or mechanically created? Just wondering, your thoughts appreciated. The word "simple" has many connotations. By no means do I consider Fratres trivial or hollow. Nevertheless, the sequence of notes can be described by a comparatively simple formula, as I've described in the analysis. This makes Fratres amazing, for the same reasons that a mathematician may consider a brief, elegant formula much more beautiful than a complex formula. Simple, in the case of Fratres, means pure, elegant, perfect. Thank you for your kind response; it helps me understand this amazing music. Thank you for this. I love your version above the actual concert version I found online - your version emphasizes the otherworldly chord progressions which I love the most about this piece. Especially the final part with the lowpass filter works very well. Very nice piece. Never heard like that in the soudchip world. Very good mathematical description. Great! Do you know something about the religious sense? Why "Fratres" = "brothers"? No, not as such. I know that Pärt was longing for spiritualism in a country where religion was more or less outlawed by the communist regime. This has, I think, clearly affected the music, and probably the title, although I'm not aware of any specific symbolism. Fratres,is it based in Passacaglia form? Fratres, is it based in Passacaglia form? No, because a passacaglia has a repeating sequence of notes in some voice (usually the bass), to which the other voices add variation. Fratres has a strictly repetitive high-level form, but the actual note sequences change from one cycle to the next, so it doesn't fit the definition of a passacaglia. Can anyone tell me about choral music of Part? Thank you for this page! Lovely SID music too, I am a long time SID fanatic as well! Hey, I do not belive that your SID song is in the HVSC ? What about releasing your song along with 37000+ other SID songs ? Oh, I just haven't got around to it. But I like the HVSC, and will try to find the time to distribute my sids through it. I'm working on analyzing fratres as well, but I'm looking at the violin version. Your page has been really helpful, and I see the chord progressions now but am having a hard time with finding the different voices (since it's just the violin in the beginning). Do you know how it's laid out in the violin version? thanks so much! Hi, this page is really helpful - thanks. Does anyone know the reason for Pärt to write the piece? I'll be playing it in a concert and would like to include this information in my programme notes. Yes, Brethren... also, the other most common use of the word Fratres is "Orate Fratres", a call to prayer from Catholic liturgy. thank you for all this (comments included!)... Part is certainly one of my favourite composers, and this piece along with those on his 'Miserere' album really go a long way to showing his genius. This is an interesting analysis. Very intriguing! I think that the "circular" step-wise motion is an effect, not a cause. I believe that the voices move that way due to the smooth, scalar voice-leading that Part chose; but I do not believe that Part was thinking in the way that you describe: which is to say that the music can certainly be diagrammed in the manner that you describe, but that I do not believe that Part had this scheme in his head when he composed the piece. Certainly, there is a harmonic additive process being employed. But I think that he was thinking in harmony, melody, and voice-leading. Of course, I don't know that for a fact, and again I don't mean to criticize your analysis--only to point out that perhaps Part was thinking in "math," from which you have distilled an interesting "equation." Forgive my tardiness. Having found this explanation of Fratres on Google (thank you Mr. Kesson for such a thorough analysis! ), I set out to intabulate it. It works perfectly without transposition. Please email me at ninebreaker21@yahoo.com and I will send you a copy of my intabulation. You can also think of the falling half of the passage as each bar in retrograde, seems simpler. As a physicist, I relish in illuminating to non technical people how mathematics and art are so enmeshed. Fratres is an elegant example of how mathematics can be beautiful and art can be mathematical. What a truly breathtaking composition! Thanks for this webpage!! !